The addition of Miis as playable characters in the upcoming Super Smash Bros. for Wii U and 3DS opens up a realm of possibilities for players, but this is not the first time the series creator has toyed with the idea. 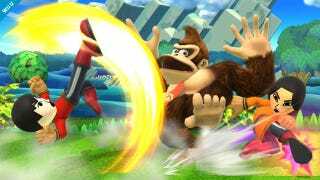 "Incorporating Miis was explored in the previous game, Super Smash Bros. Brawl, but I thought it over for about a minute and immediately decided against it." Smash Bros. creator Masahiro Sakurai wrote in his semi-weekly column in Weekly Famitsu. According to Sakurai, there were concerns about potential bullying, and the fact that Miis were generally viewed as light-hearted and simple caricatures, and not really fighting game material as either usable characters or opponents. However, the change in how Miis were viewed and utilized eventually led to a revisiting of the idea with the latest Smash Bros. "Since the release of Super Smash Bros. Brawl, the Mii has become an even more important figure as a personal icon through things like Miiverse. After all, it's a character you see every time you start up your Wii U, and frequently with the 3DS, so it would be fair to say [the Mii] is quite a famous Nintendo character." Wrote Sakurai. Eventually, the main reason for the inclusion of the Mii as a character was that it allowed players to add anyone into their game experience. Sakurai noted that he has seen the myriad of character addition requests from gamers around the world, however due to issues like copyright and development cost, most, if not all, have never been used. Giving players the ability to make and add their own character addresses such requests, if in a limited manner. Going back to his concerns of bullying, Sakurai notes that the ability to use Mii fighters in online play is disabled when playing against people you don't know. "We don't want the online play to become a copyright free-for-all and it's probably not as fun to play against someone using a character based on someone you may not know." Sakurai also noted. In his article, Sakurai's pride in the effort that went into incorporating the Mii fighter is quite palpable. "It's a feature we've put quite a lot of effort into." wrote Sakurai. "I think it's a revolutionary thing to be able to fight with Mario or Link or Kirby with your own character. Depending on who you are, this new Smash Bros. may hold quite a different meaning compared with previous iterations of Smash Bros."
Super Smash Bros. for Nintendo 3DS is scheduled for release in Japan on September 13th, in North America and Europe on October 3rd, and in Australia on October 4th. Super Smash Bros. for Wii U is scheduled for release later this year.